Tiramisu is a popular Italian dessert which is made of sponge fingers dipped in coffee, layered with a whipped mixture of egg yolks and mascarpone and then flavoured with liquor and cocoa. In Italian 'tiramisu' means 'pick me up' and the espresso coffee and sugar in the recipe would definitely have this effect! Tiramisu made with sponge fingers soaked in a whiskey caramel, chestnut cream, chopped marrons glacés, finished with home made almond nougatine. A classic Italian tiramisu - homemade sponge fingers, coffee and a rich mascarpone mousse combine to create a heavenly dessert! A super quick tiramisu made with Greek yogurt and flavoured with chestnut puree. An original twist on an Italian favourite - tiramisu made with pistachio mascarpone and strawberries. 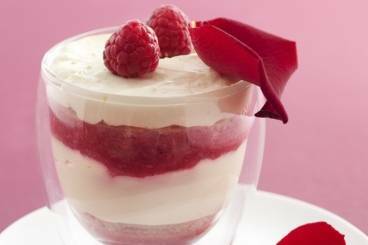 A fresh and light tiramisu made with rose water cream and raspberry drizzle garnished with fresh rose petals. A twist on a traditional tiramisu. Summer fruits gently cooked in a raspberry caramel and layered with mascarpone cheese, chopped pistachios and sponge fingers. An easy tiramisu recipe served with delicate chocolate 'marbles' made with dark chocolate and Amaretto. A lighter version of an Italian classic. Summer fruits served with layers of Chobani 0% yogurt, sponge fingers and finished with a few chopped pistachios.